People say a picture is worth a thousand words, but what if a photo leaves more questions than answers? Sometimes you see a photo and go what the heck is going on here? 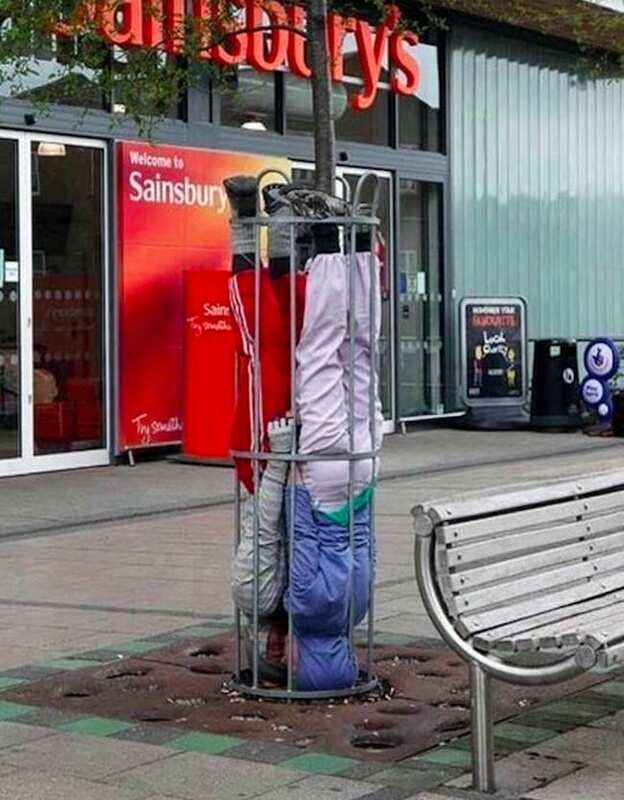 Examples include animals and in weird locations, people dressed up in the craziest outfits, or objects turning up where you least expect them to. The following photos are perfect examples of pictures that can leave you scratching your head and going huh. And even if a one or more of these crazy photos does somehow make sense to you, you might still wonder what was going through the mind of the person taking them. So, buckle up and sit tight because here are some off-putting photos that will give you millions of questions and leave you wondering what exactly is going on. 1) Now, Where Did I Put My Glasses? Here is a remarkable find. 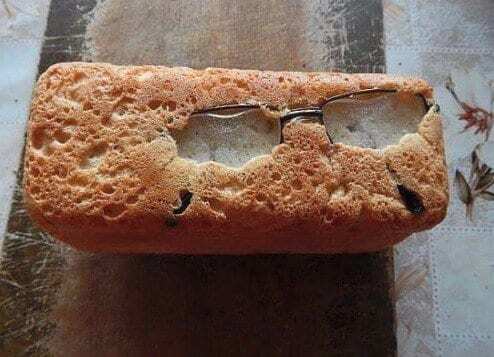 These glasses probably belong to some poor, absent-minded baker who laid them down for a moment. I’m just curious if they were found before or after the loaf bread was sold. Now, if I could just find the knife. 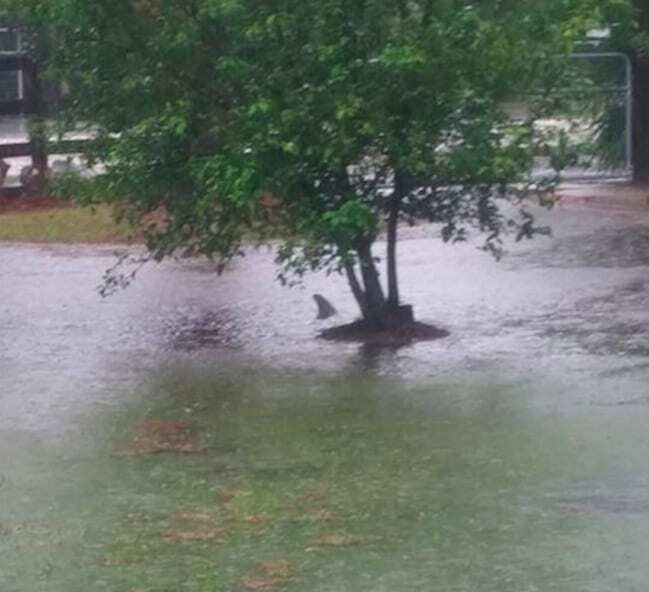 This is what happens when you have too much rain in Florida. Looks like a dolphin has found its way in from the ocean, which is better than a shark. I just hope the dolphin can find its way back out safely before the rains recede. That must be one stinky car. Talk about an overabundance of fresh piney scent. 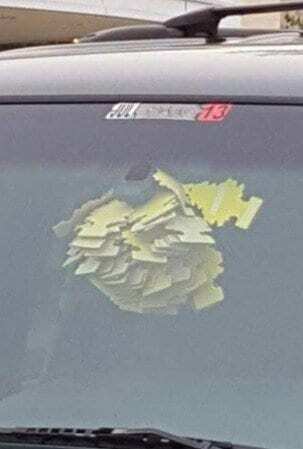 You couldn’t fit any more air fresheners on that mirror if you wanted to. I guess the bigger question is, what stinks so bad that you need that many in the first place? Hello Sir Tabs-a-lot! The fact that this guy has both the time and the money to afford to make such a costume is mind blowing. It also looks like he pays for everything in cash. 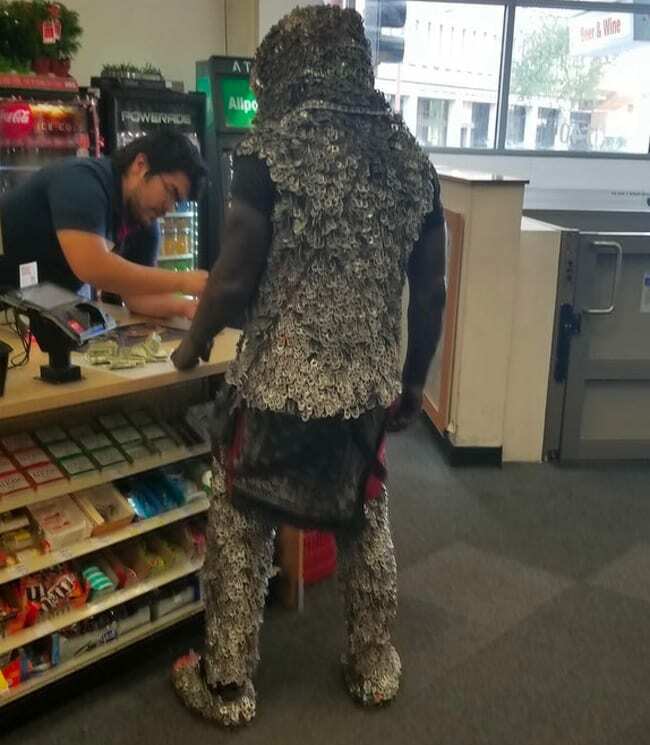 I’m curious if he returns cans for money to support his strange obsession? That would be ironic. When multi-ply toilet paper is not enough. Might as well take it to the next level. 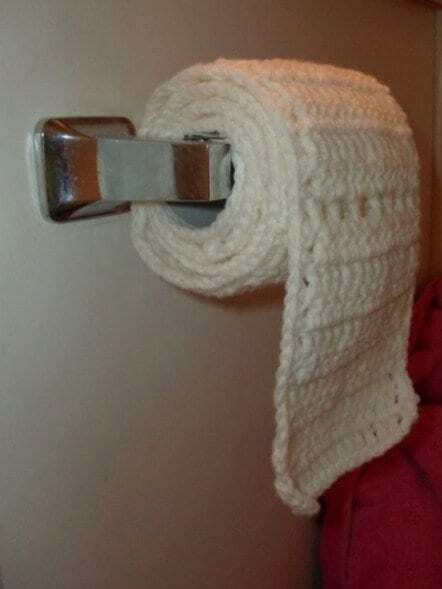 Hopefully you don’t have to go to the bathroom that often as knitting enough to use might present a problem. Then again, I am sure it is washable. 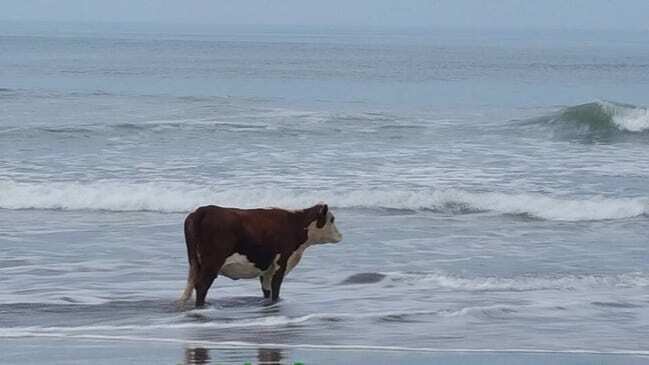 Here is a cow on a beach. First off, how did it even get there in the first place? Second of all, why does it look like it’s lost in thought? Do cows dream of a life on the sea? If they do, it must be from their sea cow roots. When you just can’t get enough pasta. Too bad that wouldn’t work in real life. 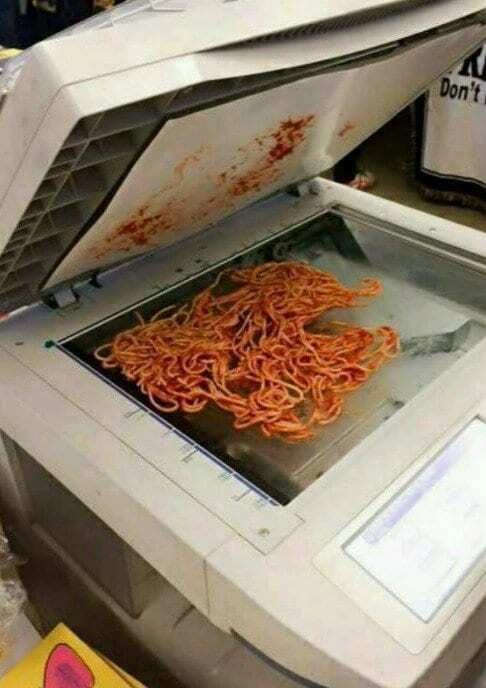 This is also what happens to pasta when it is bad and someone wants to hide it. Now, that is some creepy pasta. 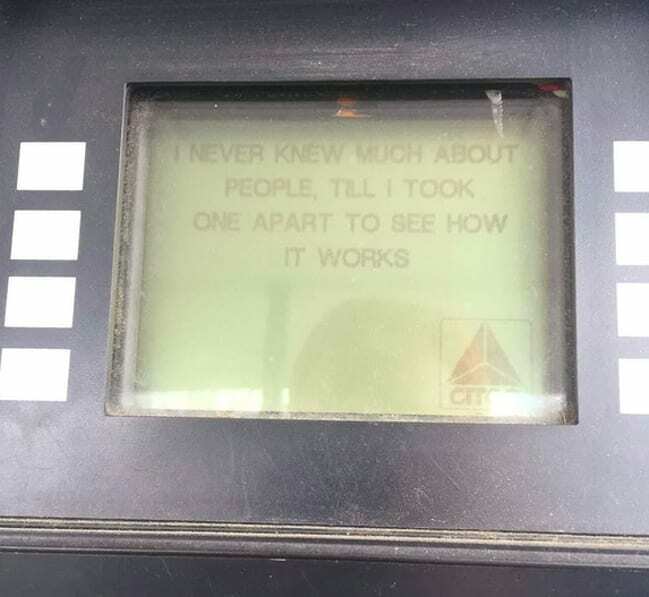 What a creepy message for a gas pump. As long as it doesn’t start talking about where it is hiding the bodies, we are fine. I honestly think this is how the machines take over. First, learn how we tick and then take advantage of our weaknesses to defeat us. 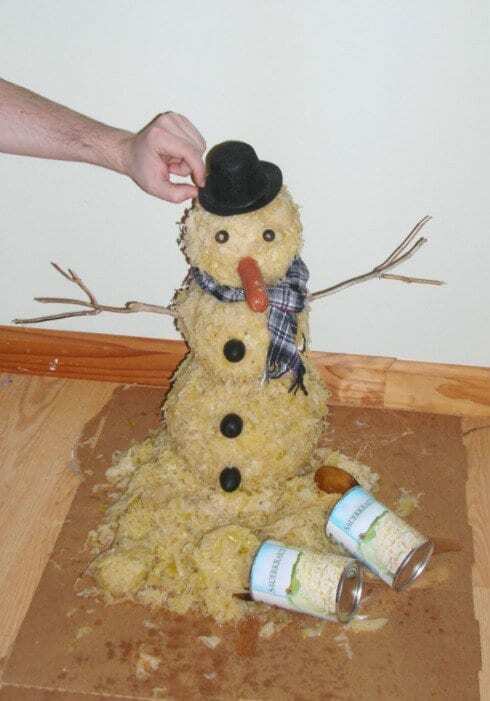 Here is Claus, the sauerkraut snowman. With a hot dog for a nose and cans for feet. Once they put on that magic hat, Claus did nothing, because magical sauerkraut snowmen are not real. As a matter of fact, after a few days they really start to smell and have to be thrown out in the trash. What an awkward position to sleep in. The look on the face of the guy next to him is priceless. 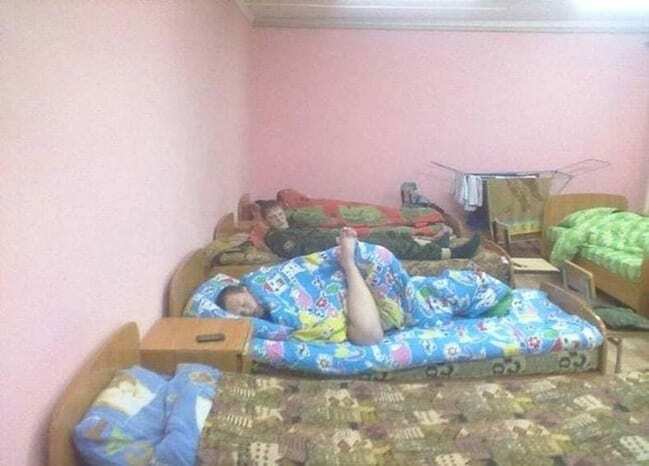 Not to mention the weirdly-colored room they seem to be sleeping in. Hopefully, his leg doesn’t get too cold outside his covers all alone. 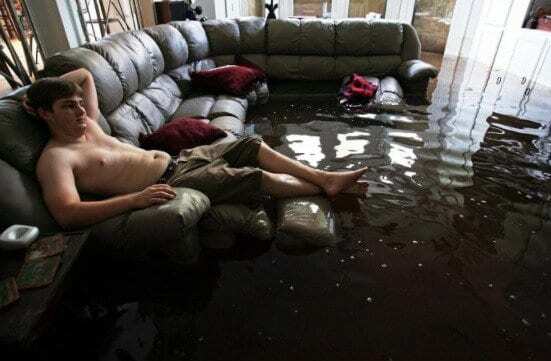 This guy seems to have no issues with sitting back in his recliner during a flood. At least he is dressed for a swim if he needs to go anywhere. Chances are this is from an area hit by a devastating flood, though it is still a strange photo all the same. 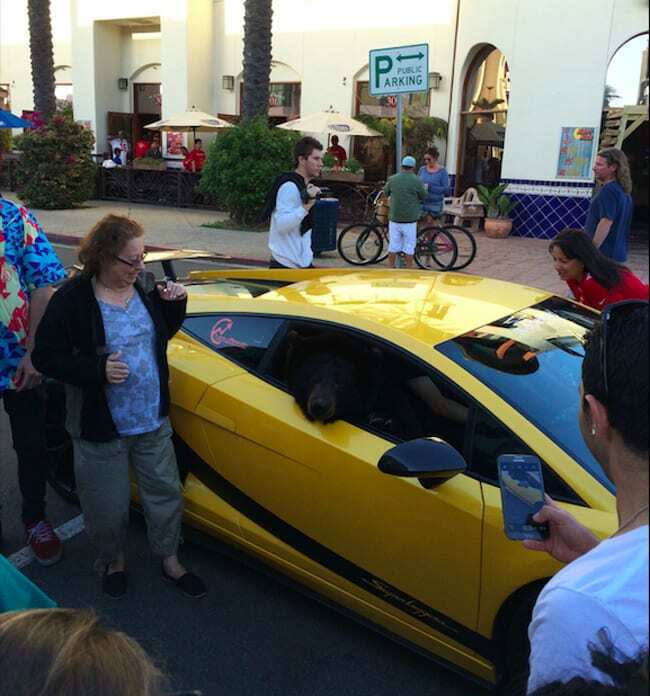 First off, how does one get a bear in a Lamborghini? Secondly, why would anyone want one in it in the first place? I’m sure someone has some explaining to do. Hopefully, the bear doesn’t get mad and decide he wants to take out his aggression on this classic car. For those times when you really want a snack but don’t have time to stop. 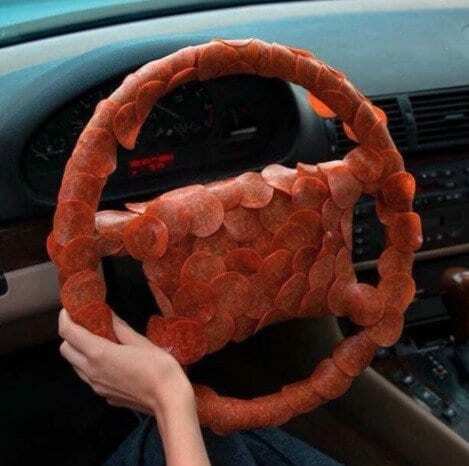 You can also find steering wheels in cheese, ham, and other favorite flavors. Just make sure to pace yourself or you could end up with no way to steer. This picture gives new meaning to the song “Love Will Keep Us Together.” It also shows how love can turn your life upside down and lead to unexpected adventures. I guess my biggest question is, how do they get out of there? 15) How Does This Even Happen? 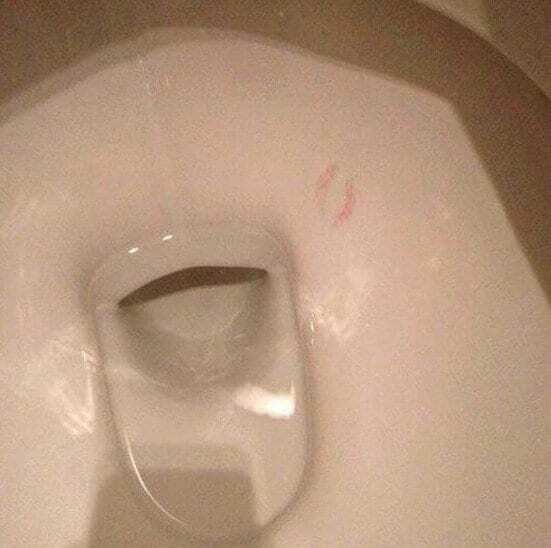 I’ve heard of kissing a lot of places, but the inside of the toilet is the last place I would expect to see a pair of lips. The person that did this is either very gross or was extremely drunk when this happened. At least someone had the wherewithal to take a picture as proof. 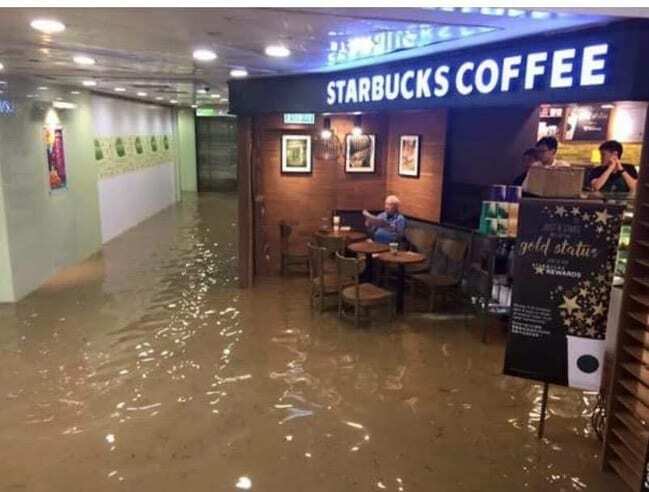 What do you do when you really want coffee but there is a flood? Why visit your local Starbucks Coffee of course. Here is a picture of someone enjoying their morning coffee and the daily paper. Never mind that the building seems to be flooded. 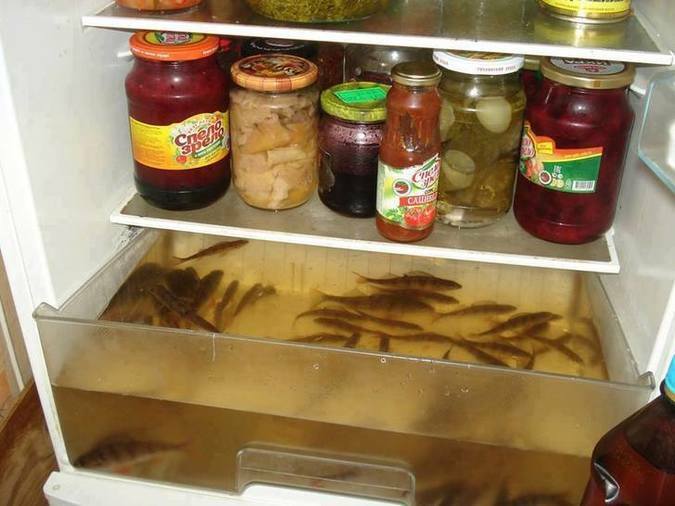 Fresh fish is a great choice when seeking healthy alternatives to junk food and foods loaded with preservatives. Unfortunately, this person seems to have taken the concept to the extreme. On the bright side, they can burn even more calories by having to prepare it first. Talk about your hairy situation. 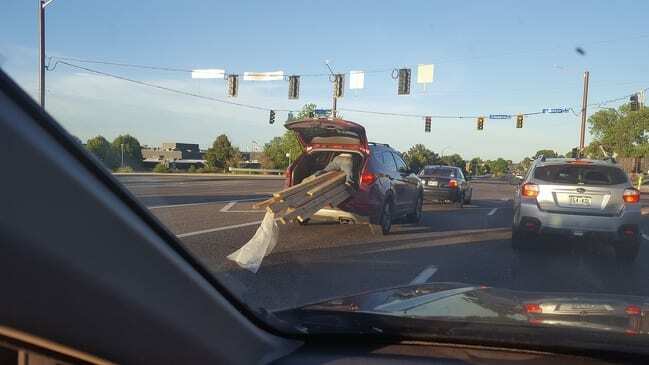 Not only is this highly dangerous, it is also not going to do much if that load decides to shift. I just hope he has his depends on because I would soil myself if that load started to shift, which is probably what will happen. 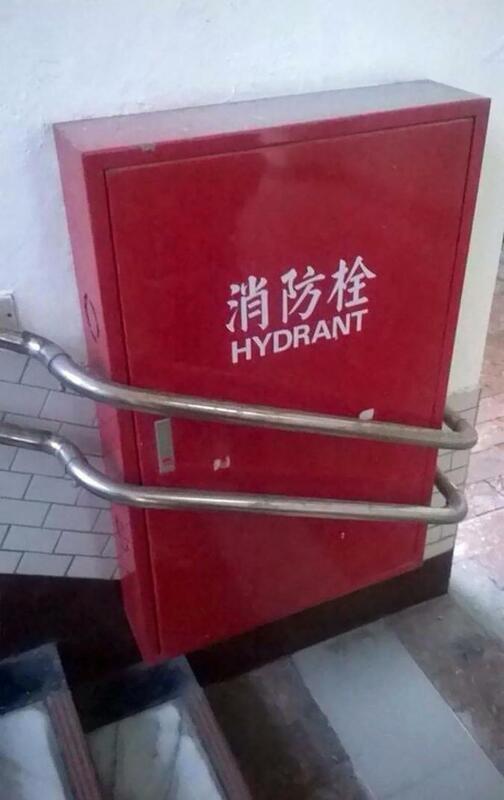 Good luck putting out a fire using this fire hydrant. By the time you say through the pipe and figure out how to open it, it will be too late. Though, to give whoever put the railing in credit, they were pretty successful about getting around that obstacle. Here’s one for the Darwin Awards. 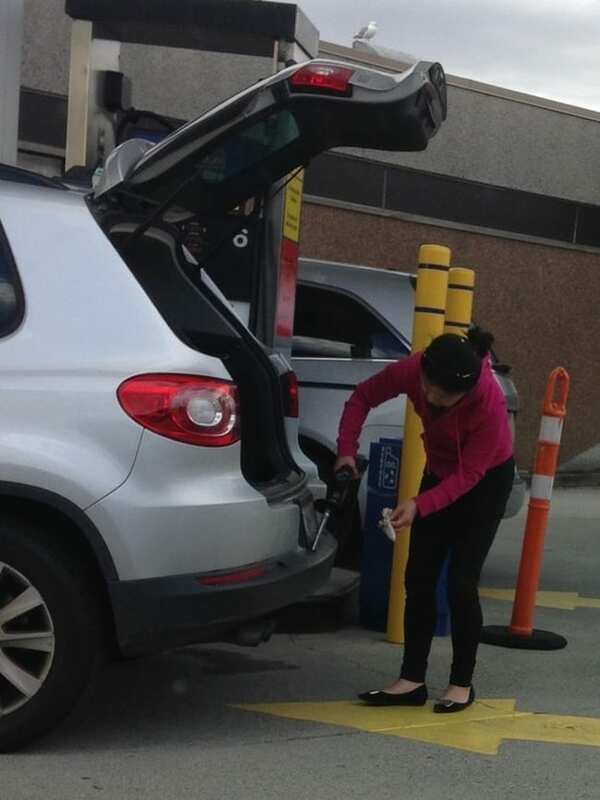 This lady thinks it is okay to clean her bumper with gasoline, at the gas station. Not only is she endangering her own life, but that of the other motorists around her. I am curious just what is going through her mind as she does this? Believe it or not, the pink pigeon almost became extinct back in the 90s. even today, the bird is still on the endangered species list with only around 500 or less of the species in existence today. 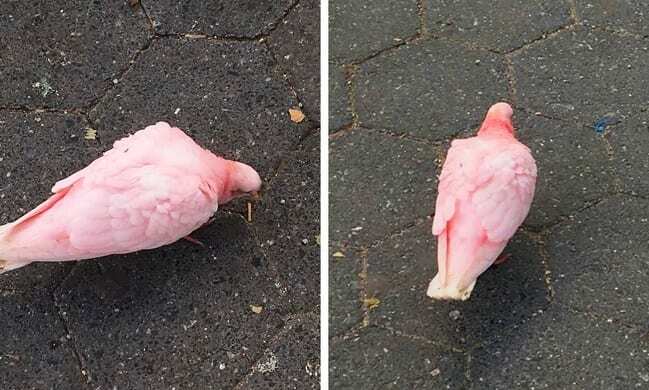 I can’t tell if this is a true pink pigeon, or is a poor that has been dyed. Here is a picture of a possum in a frilly dress. 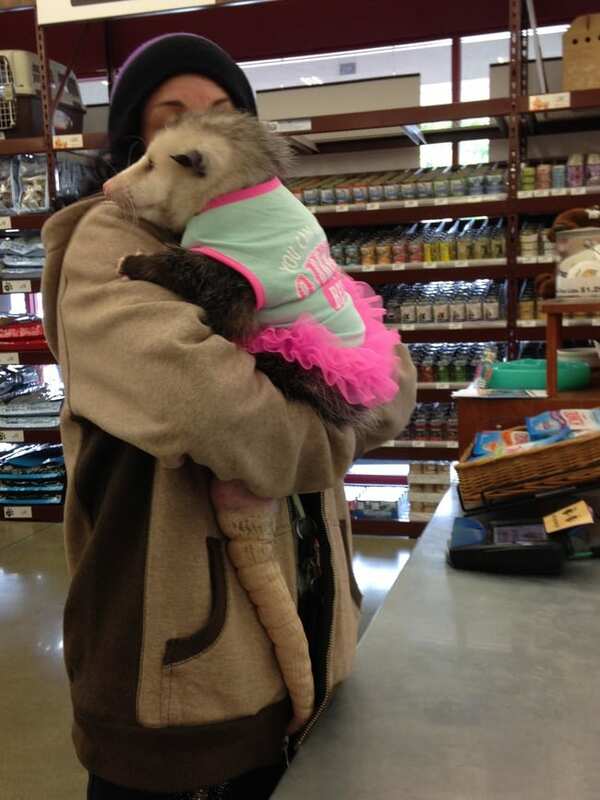 Why someone would want to dress up a possum in the first place is beyond me. Not only are they very ugly, in my opinion, but they can also carry disease, like many animals. Hopefully, she has had her shots. 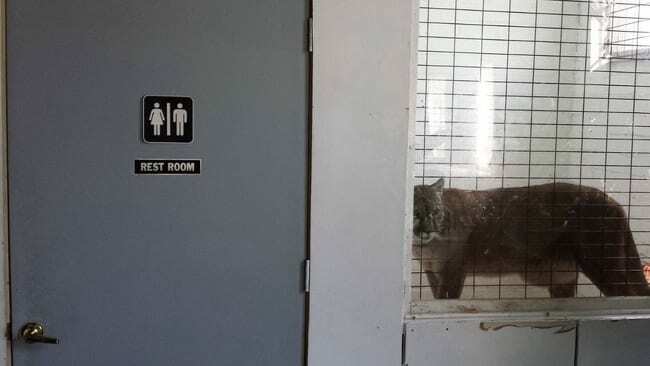 This is the new deterrent to cut down on bathroom breaks by employees. You’ll be lucky to get away in one piece with this watchful observer. 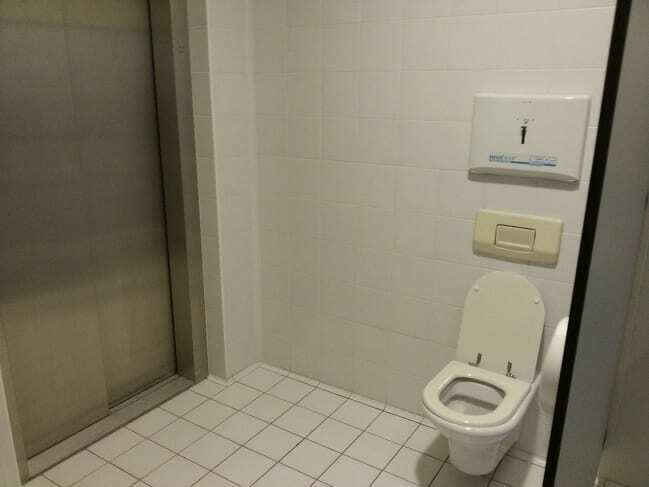 I think I will hold it and wait to use the bathroom at home. This individual is fishing in a roadside ditch. Though, that doesn’t seem to be the biggest puzzler from this picture. 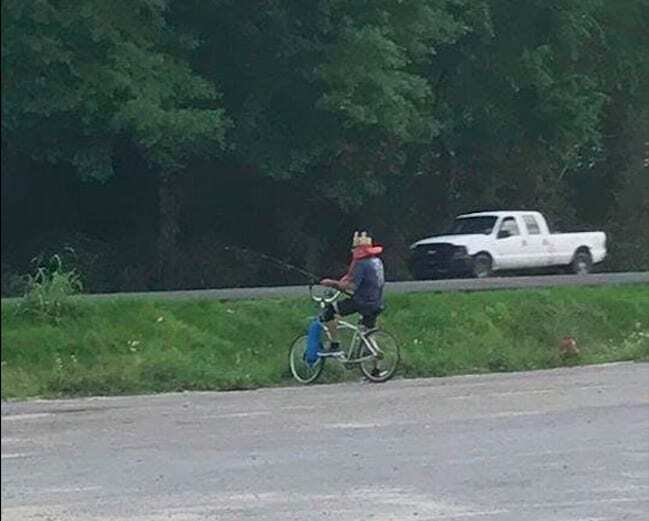 My more pressing concerns are, why is he wearing a Burger King hat and a floatation device, while riding a bicycle with a buoy attached to it? It happened to be this airline passenger’s birthday. 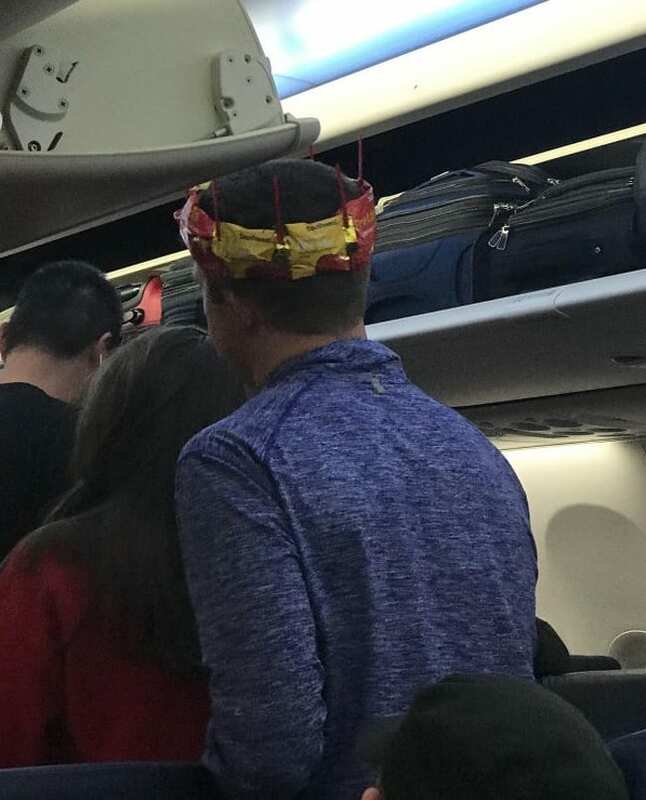 So, the stewardess made him a hat using empty peanut wrappers and miniature cocktail swords. This makes me wonder how old this person is and when do stewardess have time to do such a product? 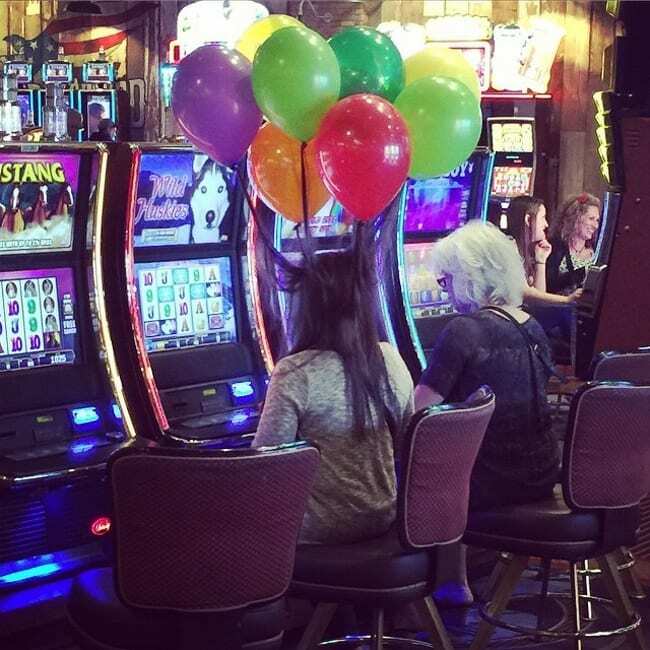 This lady looks like she is having too much fun at the casino. I also wonder just how many complimentary drinks she’s had. Hopefully her luck is doing better than her hair. At least she seems to be having a good time. What do you get when you mix ambition with a very scrawny person? Why this spectacle of course. I’m also wondering why his spotter has to stand directly over his face. 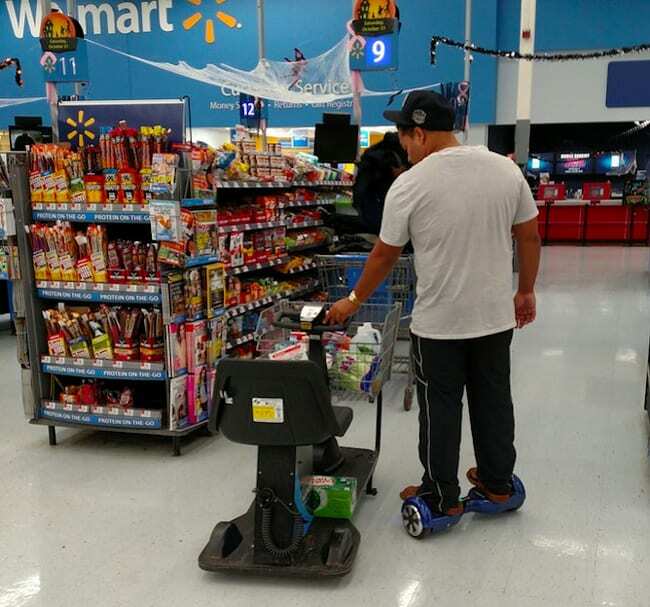 At least he seems determined to do all of his reps.
Hoverboards are for the person who doesn’t like to walk, but doesn’t want to sit in the motorized shopping cart at the store. It seems that this person has found the best of both worlds. It must be awfully hard to steer the cart from the side, though. 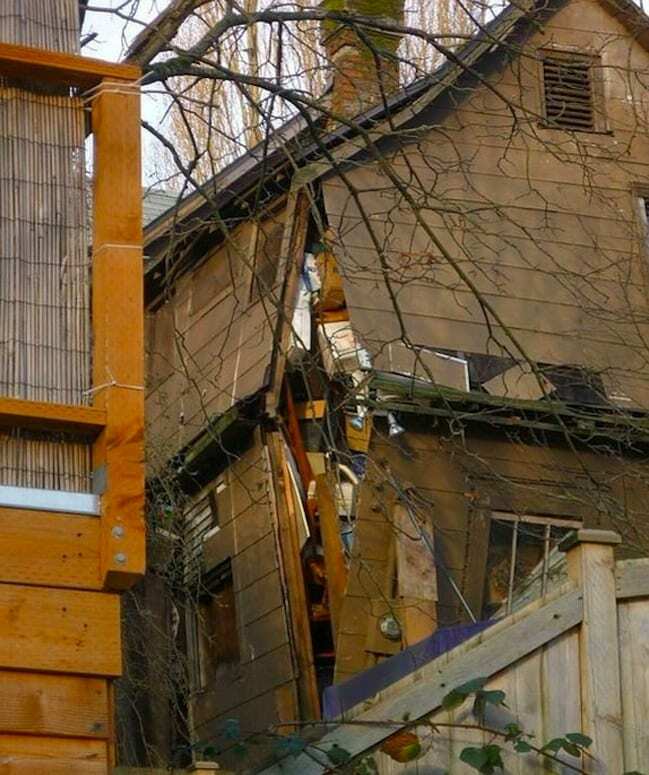 Here is a house that is literally bursting at the seams from all of the junk inside. I just wonder if the house was like that before or after the homeowner put in all of that junk. Here on the first floor we have the clothing and other accessories. On this next floor we have house wares and home decor. And finally, all off if you need to use the restroom. Don’t worry, we will wait. This is what happens when Siberian huskies make a pact. 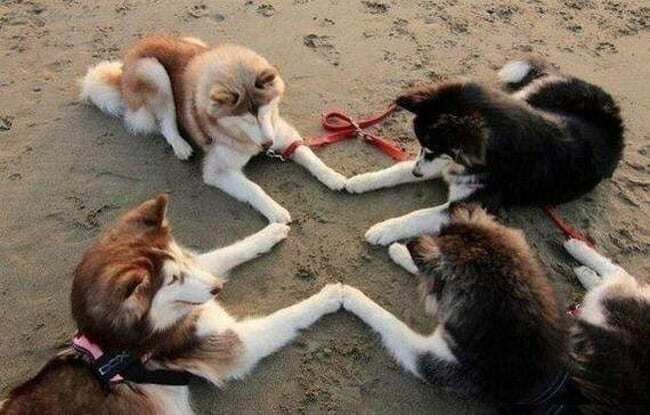 Now, I can’t decide if it is some kind of blood pact, or a Satanic ritual. Chances are it is just four friendly dogs having a little fun with each other. 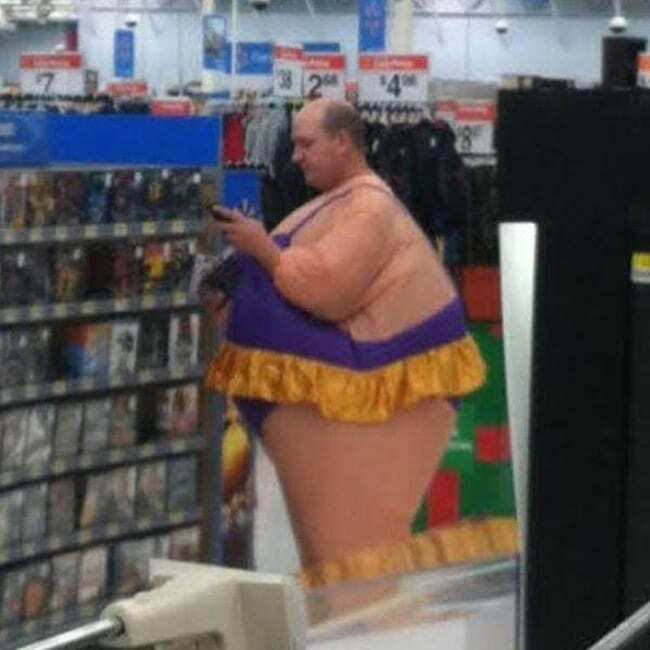 Here’s some one at Walmart who obviously doesn’t care what others think of his attire. Here he is shopping for DVDs in the electronics section. And while he is only wearing a suit, you would think he would have had on a wig to complete the ensemble. 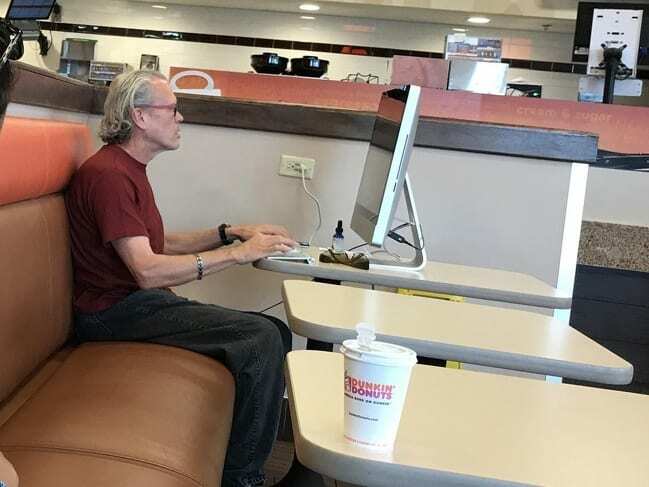 What do you do when you have really bad vision, but still want to surf the web at your local Dunkin’ Donuts? Why take your super-sized all-in-one monitor with you. Truth be told, it doesn’t look much heavier than a laptop and can serve as a good substitute for the vision impaired. 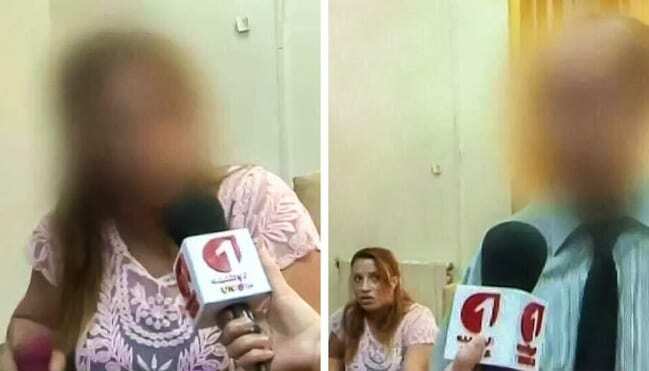 What is the point of blurring a person’s face out during an interview if you are going to shoot it in the next shot? Hopefully, this lady wasn’t revealing something about someone that could get her in trouble, or worse yet, hurt or killed. 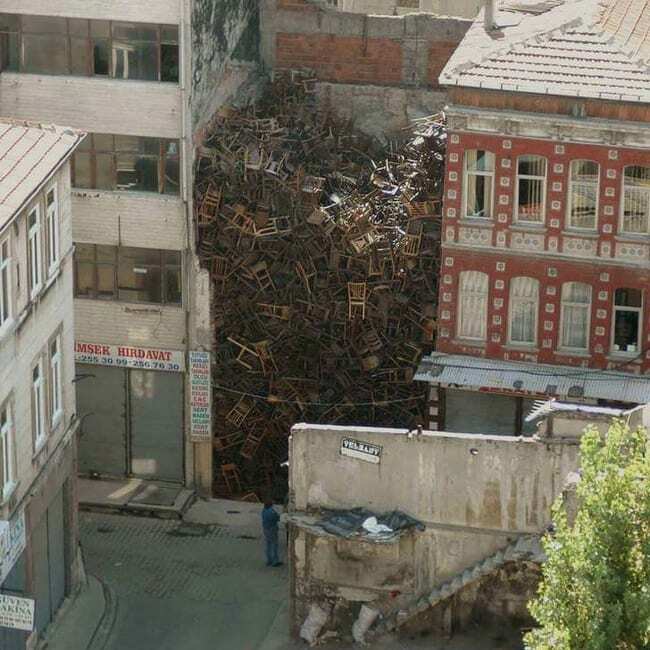 If you are looking for a chair, I know a good place to find one. Chances are, though, that you’ll have to climb to get it, or risk bringing the whole pile down on your head. Have fun climbing that stack of chairs. Be careful when using this toilet. 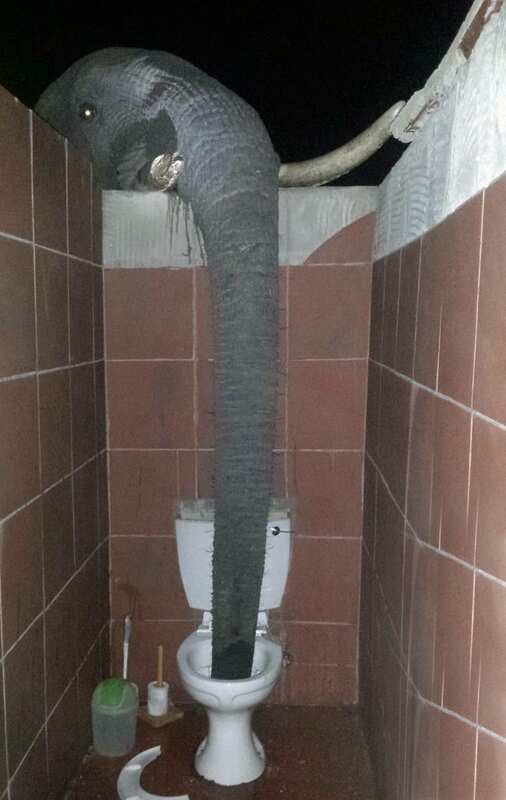 It seems this resourceful elephant has found somewhere to grab a quick drink. Hopefully, he at least waits until people are done using it and have flushed. Imagine the surprise of anyone sitting down when this big guy decides to come in for a drink. Bears are notorious for getting into places that hold food. 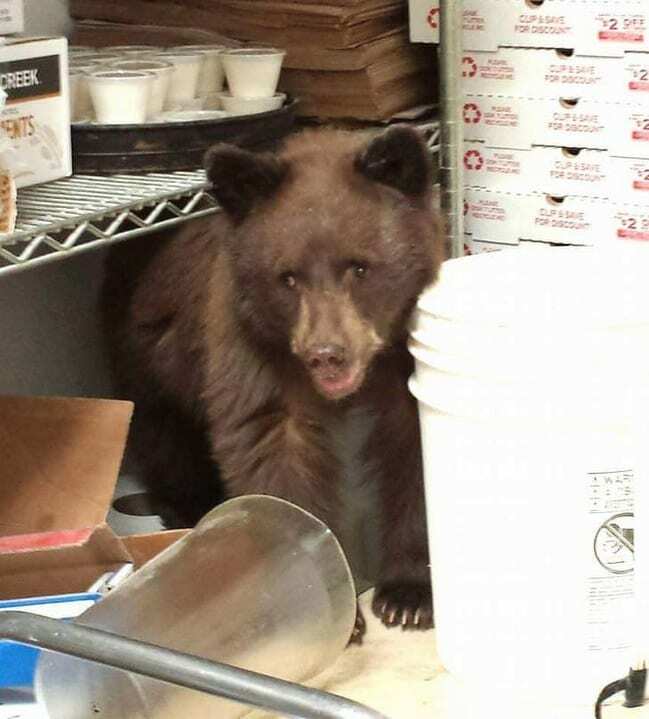 This bear has broken into the food larder of a restaurant, though it doesn’t seem like he really cares. Unfortunately for him it looks like he has only broken into a storage room and not where they keep the actual food. Someone took it upon themselves and put a pair of woman’s undergarments over the branches of this tree. On further review, how were they even able to get it on there in the first place?